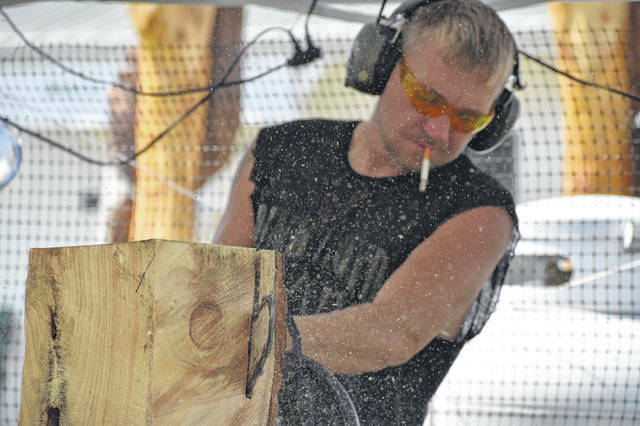 Chainsaw artist Tim Crager saws away at a the top of a bench Wednesday afternoon at the Delaware County Fairgrounds. Crager said he’s been chainsaw carving for about five years, and he added some pieces take him as long as 35 hours to carve. Crager saws while Brick, his English bulldog mascot, snoozes under his trailer Wednesday afternoon. Crager said Brick is just as popular as him at events, and he added some people come back year after year just to see Brick. 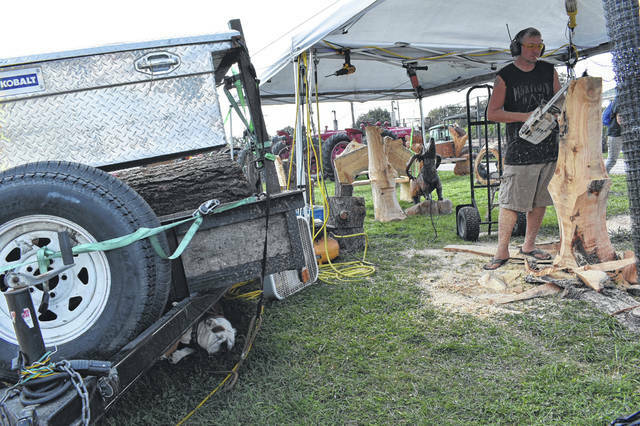 Artist Tim Crager said Wednesday that he got the inspiration to become a chainsaw carver while lying in bed one night. Crager said he enjoyed the process so much that he called his boss and put in his two weeks notice. Five years later, Crager travels from his home near Pikeville, Kentucky, and performs at festivals and fairs like the Delaware County Fair from April to December, doing carving demonstrations and selling his work, which ranges from small wooden pumpkins to benches and archways. Crager said he spends the other four months of the year relaxing, but said he can never stay away from carving for too long. Crager said small projects can be done in under an hour, but some projects like an archway he made took 33 to 35 hours. Crager said one of his favorite parts of coming to fairs like the Delaware County Fair is seeing the 4-H kids and seeing kids get out and interact with the real world. As Crager revs the engine on his chainsaw, Brick, his English bulldog, snoozes in the warm sun Wednesday afternoon. Crager added he’s got no plans of slowing down or stopping.